Happy New Year explorers! We want to wish you the best this year with lots of adventures, too. 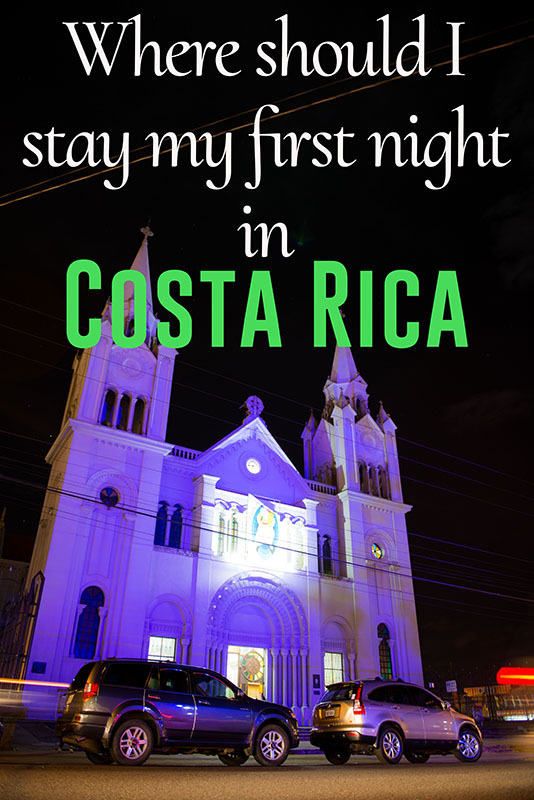 Where should I stay my first night in Costa Rica? This is a question which I receive on occasion from working as a tour guide. Many people have wanted to hear an opinion or suggestion. There are many reasons why I would recommend staying in a hotel outside of San José but initially it is important to know the plans or itinerary within the country. However, many people have already planned their trip in advance around the country and already have tours during this time. Therefore the main idea of this article is to give some guidance to those who are organizing their own trip in Costa Rica for this 2016 or 2017. 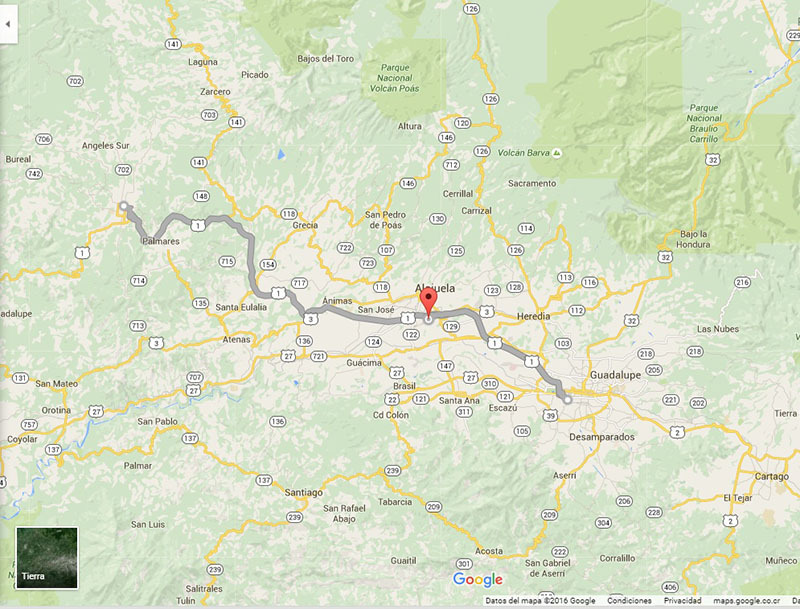 Some people know that my blogging work and base city is San Ramon of Alajuela. Most of the travelers who visit the country, stay their first night near downtown San José in order to be able to visit museums, theaters, churches and more- which is fine, because it will give them a general idea of the capital. But why not stay somewhere else? If we think from a strategic point of view it would be more convenient to stay closer the first night after a very long flight, especially after many hours waiting in airports and even worse maybe an occasional bad experience like “the airline loses your luggage”. For these reasons and many others, the least desirable experience would be to wait an awfully long time in transit to a hotel. This is a map of the main route, which takes you out of the airport. The Bernardo Soto Highway, which goes to the Northwest can take about 50 minutes at a distance of 45 km (28 mi) to get to San Ramon. By contrast there is the option to take the General Cañas highway which goes towards the east to San José (the capital), it takes about 45 minutes at a distance of 18km (11.2 mi) during rush hour or holidays it may take 15 extra minutes. 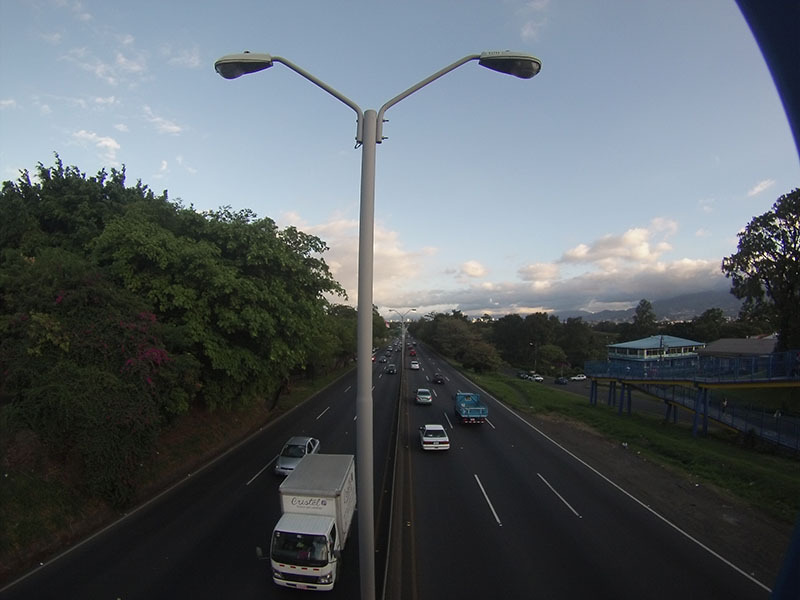 Going towards San José will be shorter in distance when compared to San Ramon of Alajuela but time will equal or be faster taking the Bernardo Soto route. San Jose and the cities that surround it are no exceptions to the large amount of traffic that can be perceived in a city. That is why it can take about 50 or 60 minutes in rush hour from the airport to the Crowne Plaza Hotel San Jose Corobici. Typically, the first night’s stay is in San José and the next day includes a visit to Fortuna (Arenal Volcano); but it is more convenient to stay in San Ramon to avoid being in the car hours since the route from San Ramon to Fortuna takes 2 hours. Staying in San Ramon allows you to walk in the center of town that is much quieter with fewer people. San Ramon is a small town compared to San Jose but it also has two museums and a big church with a great history. San Ramon is known as the town of presidents and poets. If you visit San Ramon, please send an email to explore.tikizia@gmail.com and it would be our pleasure to meet up with you. I agree having gone to school in San Ramon that it is much nicer than San Jose in terms of being more calm and accessible. The churches are beautiful, the museums are nice and the square is good for a stroll or event but places to stay can be tricky. I was fortunate enough to live with a family but unless something has changed the hotels are either hostel style or La Posada. La Posada is very nice but may cost too much for some and the others I have seen can be a bit meager in accommodations. Any suggestions or knowledge on a more mid range room? Thanks Renee for you comment! It´s great to hear that you have visited San Ramón. We have been through the same research with our family and friends when they want to visit us. However, we have found very limited lodgings options in San Ramón. The prices are between $30 (plus 13% taxes) in a private room at a local hostel in dowtown up to $150 per room in a Hotel like Villa Blanca. In the mid range accomodation we have seen Casa Amanacer Bed & Breadfast that is a little cheaper than La Posada but still no quite mid range rate. We are grateful that you have done this questions because this will be a great blog about more information of lodging in San Ramón. Coming soon!!! Hello Emma, I will say that it’s safe, however, you need to keep in mind that after you pass the airport, there is not sufficient street lamps/street lights on the way to San Ramon but if you drive carefully from 60 to 80 km per hour. (38 to 50 mph) should be fine. Also, the roads are not curved, actually that’s the road #1 (that goes all the way to Nicaragua border) and its bigger compare to others.